“When did you last see your mother? Someone asked me. Someone who was walking with me in the city. I didn’t want to tell her; I thought in this city, a past was precisely that. Past. Why do I have to remember? In the old world, anyone could be a new creation, the past was washed away. Why should the new world be so inquisitive? Don’t you ever think of going back? “Oranges are not the only fruit” by Jeanette Winterson is a lesbian classic book. After it was released it was set next to cooking books in the libraries’ bookshelves. It would be funny if it wouldn’t be tragic. Jeanette Winterson tells her own life story and the book is a memoir, rather close to a confession. There are many themes and motifs enveloped in her confession especially from her childhood : Jeanette has spent a lot of time in an industrial town in England in her adoptive parents’ house. Her mother is the main character in little Jeanette’s life and instead of a playful childhood, Jeanette is dragged in an over-religious world her mother created : her mother brought her up as one of God’s elects and raised Jeanette as being destined to be God’s missionary. 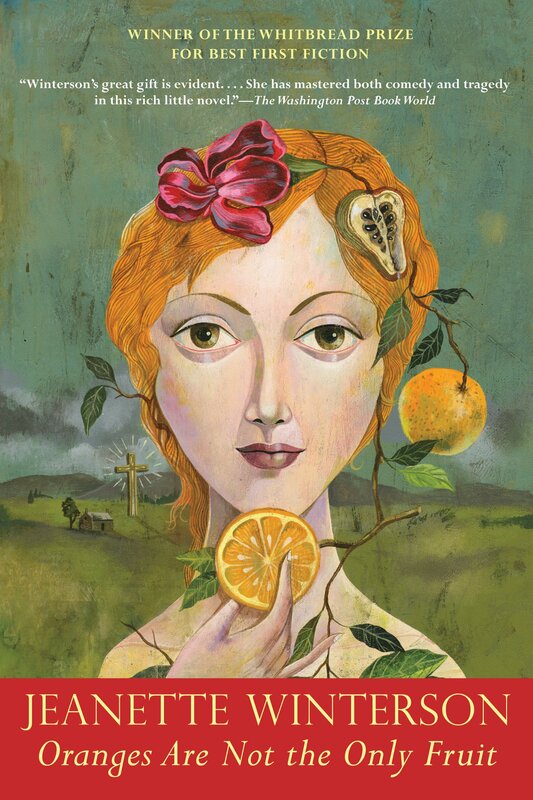 In her zealously, Jeanette’s mother offers her only oranges as the only fruit, a symbol of that Jeanette should always do as she is told, by herself in a religious excess and human obsession – the oranges represent heterosexuality. Jeanette doesn’t even go to school until the authorities oblige her adoptive mother to and school is also a bad experience for a religiously inoculated Jeanette, who ends being marginalized and laughed at by her colleagues. Her mother is not interested in anything but religion, religious societies and missionary priests. To please her mother, Jeanette takes her role seriously and helps in converting other people to, but the turning point is when she falls in love with one of the converts, Melanie and although she can’t tell what it means, she understands her mother will hate her for it, but her secret is discovered by her mother and starting now, Jeanette’s image is changed in her mother’s eyes and starts becoming an outcast at home. There are many characters in the book that sustain the two main characters : overzealous women from the church, the two ladies from the newspaper shop that love unholy, Elsie, Janette’s old friend, Melanie and the pastors. The book has chapters as the Bible has in the Old Testament: Genesis, Exodus, Leviticus, Numbers, Joshua, Judges, Ruth, obviously the Bible holds a great deal in Jeanette’s life, especially in her childhood, but she doesn’t only obey it, but also she questions it, disagrees with her mother and the pastors, starting with the moment when she is accused as being unholy when she falls for a woman and her mother realizes she cannot be the missionary she was raised for to be. Her mother wants Jeanette to go away from home, she doesn’t want her here to ruin the plans she has left for the church or the missionary societies she fights for. She doesn’t care about Jeanette’s feelings, Jeanette’s dreams or desires as a young woman to evolve and do something with her life searching her talents. Because she ruined her mother’s dream who raised her to become a missionary, her mother’s unfulfilled dream herself, she threw Jeanette away. That proves she only used Jeanette for her selfish misfortune. Jeanette leaves home at 16 years old and works hard to sustain herself. It doesn’t matter, because she was out of a toxic environment that treated her as an outcast anyway. She works hard because she knows this is the only way she can follow her heart, her dreams and to end up in the big city. She won’t end up with Melanie nor other converts, but she will find love in the big city. I loved how the author sees her story within a fantastic story of Winnet, a sorcerer’s apprentice, who will have to choose between the castle and the village, who will choose the village instead of her heart to become of stone. Living in the village, working hard she hears of the big city and all the possibilities it holds for her dream and will face many obstacles to end up there and become free and live the way she wants. The story is a metaphor for Jeanette’s real life story. I loved the way the story was told, I enjoyed the characters and the main theme: to sacrifice her comfort, her past, her childhood home and her mother’s love to pursue her heart and her dreams.